Thing 1 carried the day (week). I don’t care (well, actually I do but work with me here…) how many gold bugs leave the subscriber base while I am not able to give a long-term green light, but we are going to track the proper fundamentals, not the imaginary ones. And this bounce along with China, copper, global stocks, US stocks and everything else in the cyclical world is not proper. Not until all that crap tops out. It. Is. 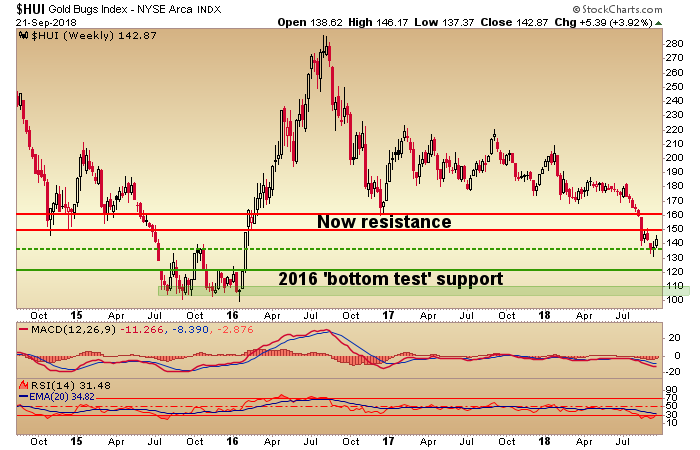 A. Bounce… until it proves otherwise by seeing gold rise against CRB, SPX, ACWX and while we’re at it, global currencies. So for now it’s just a bounce, and the [daily] Silver/Gold ratio did make a positive hint of Friday. As is often the case, the sector will rally with cyclical assets if the rally is anti-USD and/or inflationary. This is not long-term positive signaling for the gold miners, however. Quite the contrary. So if you’re in them, enjoy the bounce – insofar as it continues – but be prepared to sell (if you are not positioning L/T) because if the other stuff liquidates the gold miners likely will as well, perhaps before hand and perhaps even more intensely. 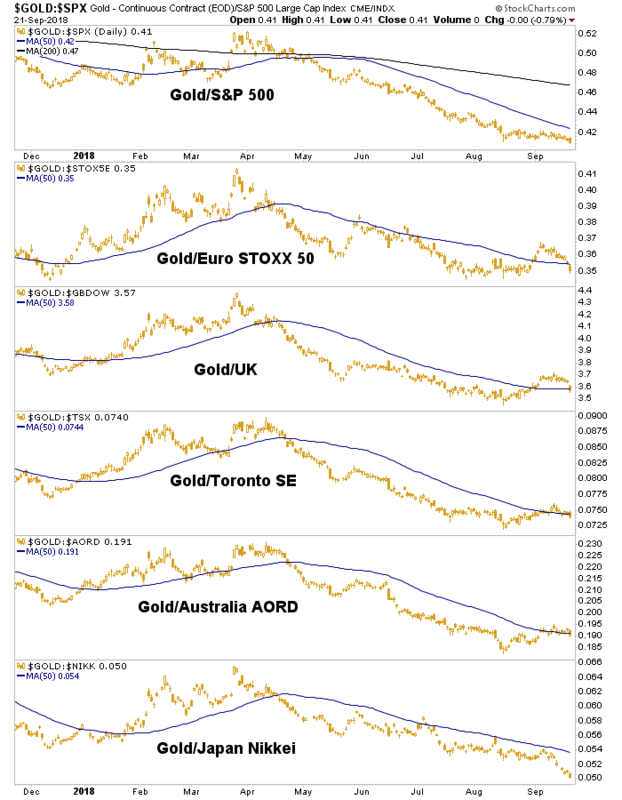 Here is the view vs. stock markets; also not pleasing if you are a gold bug wanting to buy [gold stocks and gold related investments; it’s always a good time for physical gold as a value anchor & insurance] for the right reasons. Now, this pretty cyclical picture [risk ‘on’] could come apart tomorrow and then we’d pound a table, fundamentally. But here at NFTRH we have got to deal with what we see, not what we hallucinate. There’s enough of that going on in the gold “community” already. 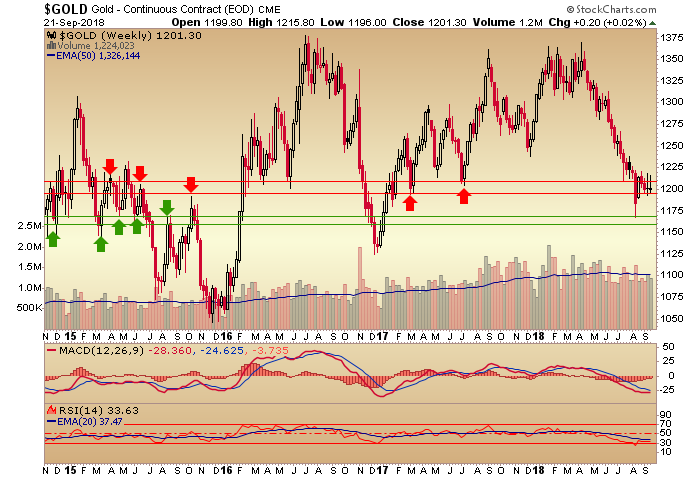 Gold weekly is still stuck in the resistance zone during the inflationary cyclical bounce. 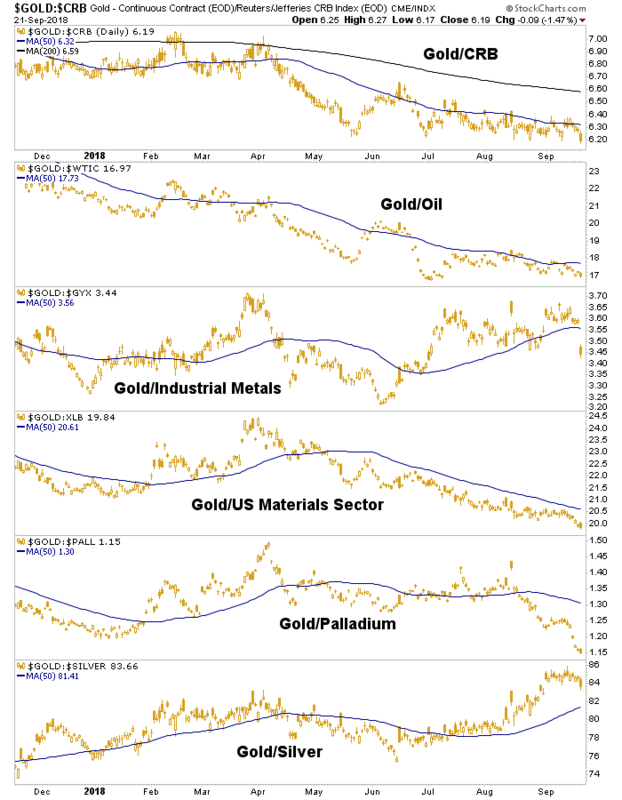 Gold’s lack of participation is actually not such a bad thing when you think about it. Silver however, would need to get going and lead during an inflationary play. 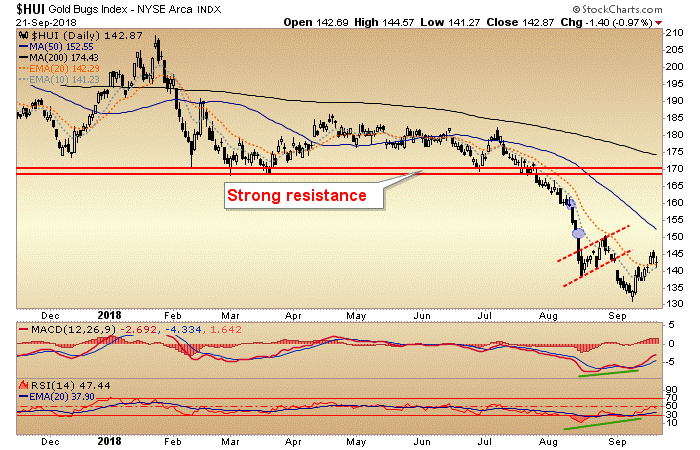 HUI got within 4 points of initial resistance at 150. The daily chart shows that resistance area to coincide with the SMA 50. Folks, if it bounces again and funda do not change, I’d have some caution there. I am going to skip the cavalcade of gold stock charts because well, on balance they are lousy (with some exceptions). I cannot in good conscience put too much into this sector at a time like this, when it’s bouncing and the fundamentals are not engaged. We looked for a bounce and finally it came. Unfortunately, it came as part of an anti-USD global asset bounce. It’s not legit. I am not saying run out and sell gold stocks if you own them. I am saying don’t hold them if you think that inflation is going to drive all commodities up while the global economic cycle remains positive. There are all kinds of different investors. 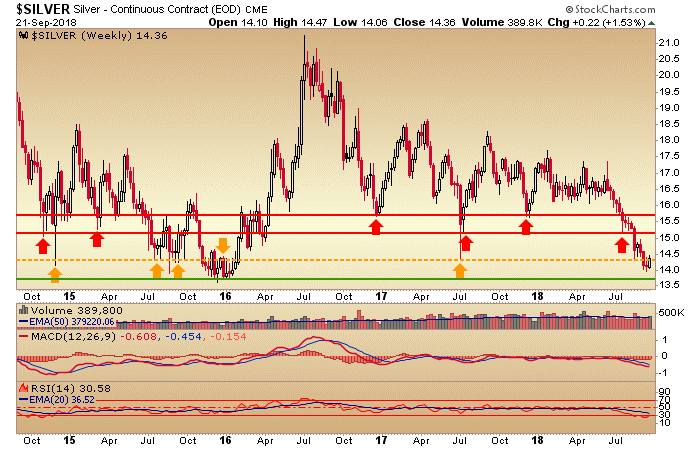 One might have bought the hard spike down to the first support area of HUI 135 a couple weeks ago with the idea of adding more on a further crash to 100-120. But one is currently doing this against poor fundamentals. One might be anticipating the end of a cycle and patiently adding quality names. That’s legit. What is illegitimate is this inflation pumping by the worst of the gold herd. There appears to be late stage cyclical stuff going on but these candles measure in months. 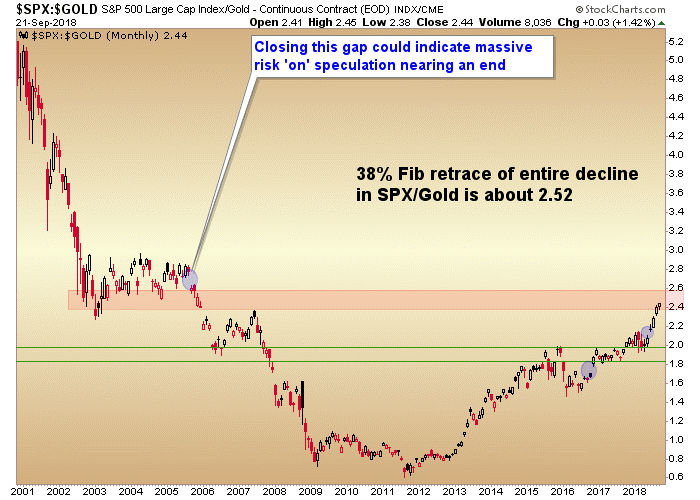 For instance, even if SPX/Gold is close to topping out at the 2005 gap how many more months will it take for pure, unbridled speculation and greed to play out? And how unpleasant could it be all along the way for the lowly gold bug? Know who you are and how strong you are before positioning on forward expectations.